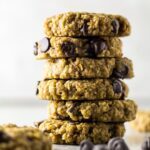 Deliciously soft, chewy, and healthy banana cookies that are loaded with oats, peanut butter, and chocolate chips. Perfect for a sweet breakfast or a quick snack! Preheat the oven to 180C/350F/Gas 4, and line a baking tray with parchment paper or a silicone mat. In a large bowl, mix together the bananas, peanut butter, vanilla, oats, and cinnamon until combined. Fold in the chocolate chips. Roll the mixture into 1.5oz balls and place them onto the prepared baking tray. The mixture will be quite sticky. Flatten the balls out and shape into circles. Bake for 15 minutes or until firm to the touch and lightly golden on top. Allow to cool for 5 minutes before transferring them to a wire rack to cool completely. These cookies stay fresh, stored in an airtight container, at room temperature or in the fridge for up to 1 week. They also freeze well for up to 3 months. Thaw overnight in the fridge before serving.